Description: Emmeline is an 11-year-old who contends with a special problem: after a long sickness she can no longer speak. Her illness left her unable to give words to her thoughts, and she can only use the occasional snatches of sign language. 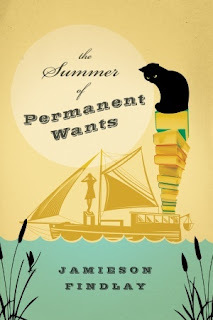 Closed off from her friends and the world of kids her age, Emmeline is excited to spend a couple of months with her bohemian grandmother and her newest project: starting a floating bookshop that will sail from port to port all summer long. From the books and people they encounter aboard Permanent Wants, Emmeline travels to places, real and imaginary, that astonish and bedazzle her in turns. From the discovery of a map of a now unheard-of land, to a town whose citizens are no longer able to make music, to the revelation of an island filled with serpents and snakes, Emmeline's adventures show her wonders that help her unlock her own self.A literary adventure story with a classic feel, The Summer of Permanent Wants will delight and engage middle-grade readers. "It was also Picardy Bob who had painted the name Permanent Wants on the bow and stern, along with the words, "The Floating Bookstore." He had a very careful hand, being a forger." "Em was tempted to give a good blast of the whistle right in the library -- the old librarian moved so slowly." "Lafcadio gave her a reproachful look as she hauled herself, dripping, up the ladder. "You should really learn to like the water, Lafcadio," said Gran, grabbing a towel. "You're a shipboard cat now." I have this to review too... good to see such a wonderful review! I'm looking forward to it.